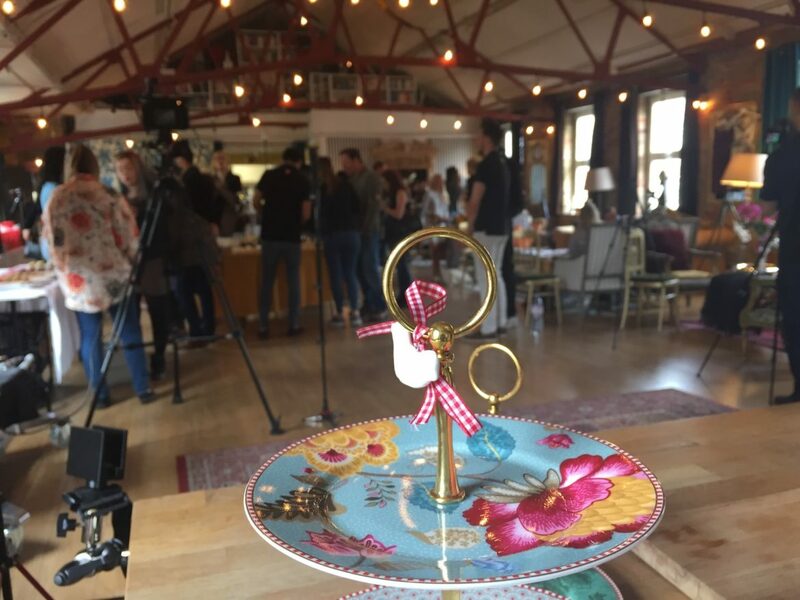 On Saturday 20th May I was invited to a Manfrotto Vlogging Masterclass in London. I’ve never been to any workshops on vlogging before; everything I’d learnt had either been from good old trial and error or watching YouTube videos. The event was held near Southwark in SE1 – not far from London Bridge at Lumiere London loft studio – a popular venue for things like events and photo shoots, and was kitted out with some beautiful furniture and décor. Even some of the people rockin’ on up to the event were glammed up; I was worried I’d bring the tone down in my jeans and tee, but it was a very relaxed, informal atmosphere so I needn’t have worried. On arrival we were offered drinks and canapés and were given the opportunity to do a bit of networking with other vloggers. Everyone was really friendly which was reassuring – especially when you walk into a room and don’t know anyone. The first workshop kicked off with Josie from Fashion Mumblr who has been vlogging for about 18 months and has managed to amass 126,000 subscribers! I couldn’t believe it when I heard this – I nearly fell off my chair. Always write in the description box and try to reword your title. Include SEO words but make it natural! Find your own time to post that works for you; don’t assume posting at popular times will work for you as your videos may get lost amongst all the other people uploading. There were a few more workshop sessions, with mini breaks in between to grab a drink and eat the delicious canapés. We had a chat from the Manfrotto guys on how to use lighting, how light works (including how it bounces around and disperses and how to combat this), plus what equipment we can use for good lighting – whether we were a pro or an amateur. I learnt about frame rates, shutter speeds, aperture, 4k cameras (apparently the ones to use), video editing, ring lights…you name it! My head was buzzing after that session with lots of ideas to consider. Following that, we all had the opportunity to write questions on post-it notes – any answer that we wanted to take away from the day, which was a great idea. I asked about microphones for iPhones (as I still use my iPhone to film on) and sometimes lose the sound quality. I also asked about which apps are best for video editing. So what did I learn? Well, quite a lot actually. The app Filmic pro was mentioned as a great video app. Apparently, it ‘turns your mobile camera into a broadcast worthy high-definition video camera, enabling you to create stunning video content with unprecedented control and customisation.’ Definitely one worth looking into. I also heard the name ‘lumi light’ for the first time – an introductory light that vloggers often use to stabalise their lighting conditions. And in terms of microphones for iPhones, Senheiser’s products are ideal or, if you are recording from further away, then a Zoom iq7 (or omni directional mic) would work best. I have to be honest, I hadn’t even heard of Manfrotto prior to the event and now I know that they provide any type of equipment you need for your videos – from tripods and lighting through to supports and a whole plethora of accessories. Manfrotto must have been feeling generous that day as they ran a competition for attendees, with the three most inventive Boomerang clips posted on social media (using the hashtag #ManfrottoMasterclass) winning one of their Shoulderpod products – high quality holders for smartphones to help make creating smoother videos easier when you are on the move. 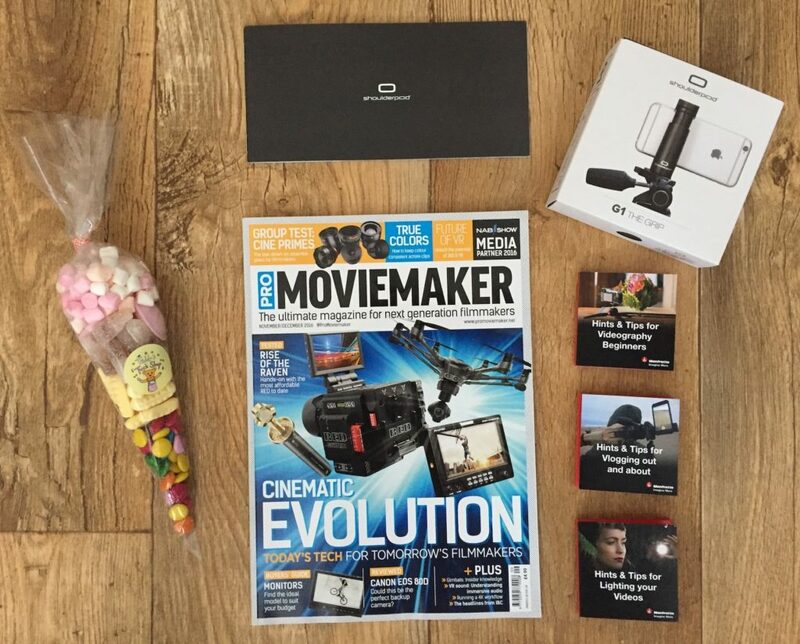 And although I didn’t manage to bag a prize, I did receive a goodie bag from the day, which consisted of Moviemaker magazine, a bag of sweets (they definitely knew I was coming! ), little guides on vlogging, a (universal) G1 mobile grip and a voucher for 20% for my lovely readers. So if you like what you see with their products and fancy getting yourself some professional gear that will last you a lifetime, use the code ‘Follower17’ at the checkout. I learnt a whole heap of information and managed to meet a few other (really nice) vloggers including the lovely Daisy from Pretty Green Tea, who has been blogging for more than eight years and writes about her daily life, style and city breaks. Check out her fab vlogs too! Apparently, this was the third event that Manfrotto has held, but the first event on vlogging. 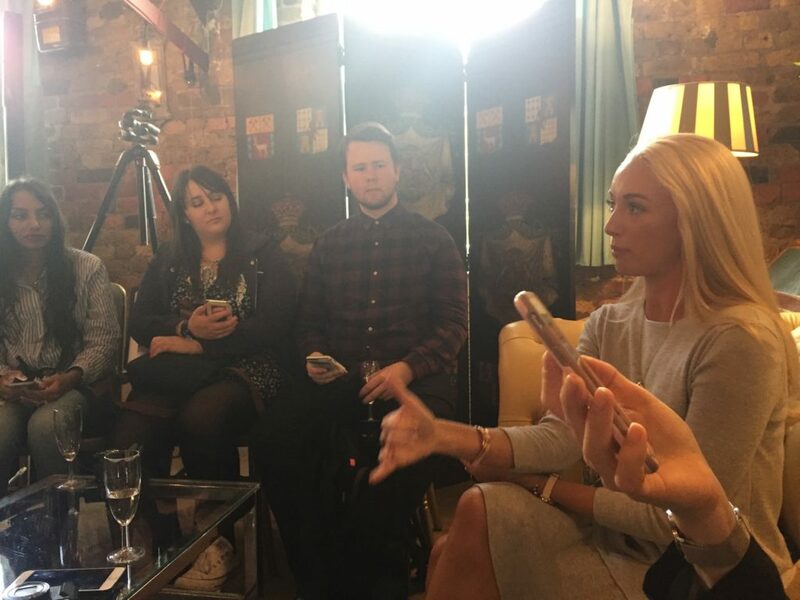 I think they did a sterling job and I learnt so much – not only from the team at Manfrotto and the speakers, but also from the vloggers who were attending too, who were happy to share their experiences. And that’s what took the event from good to great; a relaxed vibe, plenty of learning and a great bunch of people. I know I’ll definitely be getting my name on the list for next year’s event. This sort of event is great to really improve your skills, although I avoid vlogging like the plague! It sounds like a really useful event, thanks for sharing all the handy youtube tips too. That sounds fantastic Lauretta. I’m trying really hard with vlogging at the moment as it really engages the kids, and that’s one of the reasons I started my blog. So feel free to pass lots of tips my way!! I think I’d be rubbish at vlogging – I’m much better behind the camera than in front of it! I think they do them every year so it’s one to keep a look out for! These are great tips! It sounds like a really informative and interesting event! Thanks Sarah – certainly was. If you have any questions Kaz – shoot them over…happy to help! I have been thinking to start developing videoes and to start a YouTube channel so all these tips are very helpful for me. I’m glad to have come across your post. Thanks Fatima – best of luck if you do go down that road! This sounds like a great event, thanks for sharing the tips! 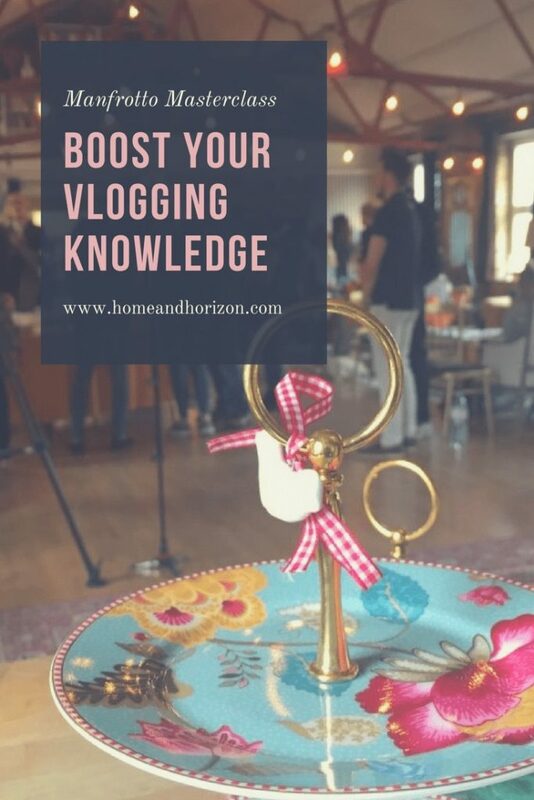 This is such an informative post – I vlog with my husband so will be taking some of this onboard! Great it was helpful – thanks Mellissa! It sounds like a really informative and eventful session for sure, I am impressed she’s managed to have that many views in 18 months. Yes I know – amazing isn’t it?! !